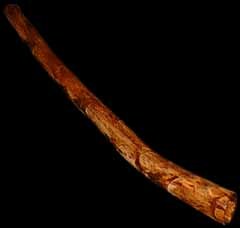 Wind instrument invented by Australian Aborigines, which is a hollowed out Eucalyptus tree branch or Agave cactus with a bee's wax mouthpiece. The instrument is played with buzzing lips like a trumpet but employs the technique of simultaneously breathing in through the nose while squeezing air out of the mouth with the cheeks. This technique is known as circular breathing. A variety of sounds and tones can be produced while playing this instrument. This one was made by Allan Shockley.